While most charity programs are geared to see only certain patients, Hospital Bedside Magic® is committed to reaching every sick kid in a hospital. Our volunteer Hospital Magicians are trained to adapt their magic interactions for kids in burn units, protective isolation rooms, oncology, neurology, and throughout the hospital. We see all kids — regardless of their physical or cognitive limitations — because we believe every child deserves to experience the healing, therapeutic power of magic. Being hospitalized can be extremely stressful for any child. Unfortunately, many children are facing life-threatening illnesses. Those in protective isolation spend their days battling their illnesses in closed-off hospital rooms. Anyone who enters these rooms must follow a strict, infection-control protocol. The good news is that our Hospital Magicians are specially trained in isolation protocol. They wear protective clothing as required and bring only clean, brand-new magic materials into these rooms. Because of our innovative Isolation Program – developed under the guidance of medical professionals – we are able to safely reach kids who were previously cut off from the rest of the hospital. Being hospitalized doesn’t only affect the young patient. Fear, worry and the draining hospital routine is hard on the whole family. Parents are challenged to be strong in the face of frightening unknowns. Patients are scared because they can sense their parents are worried. Siblings may alternate between worrying about the patient and feeling resentful about lack of attention from preoccupied parents. Bedside Magic® is designed to reach not only the patient, but everyone in the hospital room. 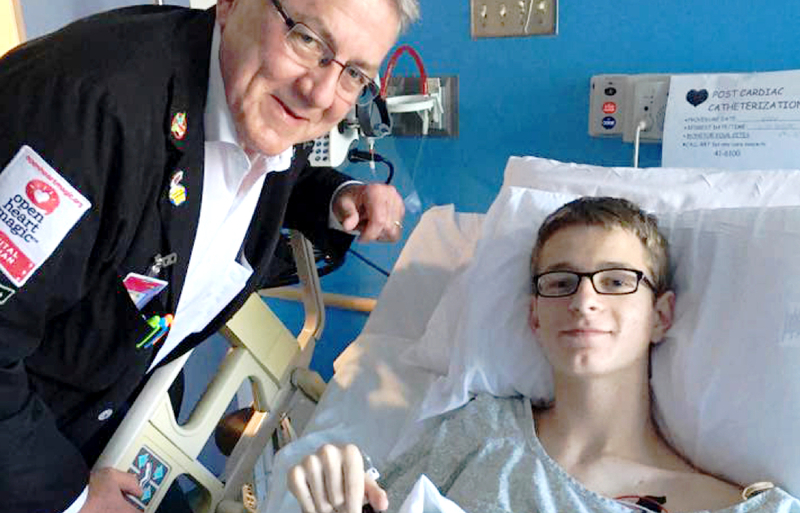 Our volunteer Hospital Magicians engage patients, siblings, parents and friends in the fun, laughter and wonder of magic. Creating a hopeful, positive experience for the entire family is beneficial to a child’s healing. Because the language of magic is universal, there are few limitations on its ability to reach a diverse population of young patients. In addition, Hospital Magicians receive specialized training in how to adapt their magic interactions to accommodate different cultures, languages and any physical restrictions patients may have (i.e. being unable to speak or use their hands). Hospital Magicians work with kids ages 4 and up. The seemingly “difficult to reach” patients are often the ones who respond best to magic.